Loved almost everything. Bad stuff: Spotty WiFi. Mattress & pillows were too mushy (I prefer firm) so my sleep suffered. A/C needs overhaul or upgrade due to cooling issues. Good stuff: Food. Staff. Location. Rooms. Customer service. Hotwl perks. Beach access. Where to find St. Lawrence Gap hotels near an airport? 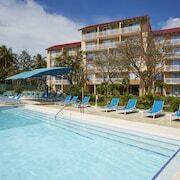 Where can I find hotels in St. Lawrence Gap that are near tourist attractions? Room choices are many and varied in St. Lawrence Gap. 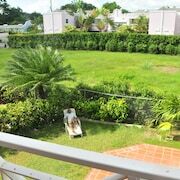 Spend some time looking through our 94 accommodation listings, which are all within a 0.1-kilometre (0.06-mile) radius of St. Lawrence Gap's center. Finding a place to base yourself in central St. Lawrence Gap is only a few mouse clicks away. 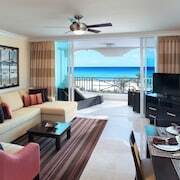 Expedia's comprehensive database lists the Turtle Beach by Elegant Hotels All Suite All Inclusive and Ocean Two Resort & Residences, which can be found within a 1-kilometre (0.6-mile) radius of the city center. Students, families and the more budget conscious will find some great St. Lawrence Gap accommodation options that definitely won't break the bank. 0.1 kilometres (0.1 miles) away from St. Lawrence Gap's downtown area you'll find the Divi Southwinds Beach Resort. The Infinity On The Beach is just 0.3 kilometres (0.2 miles) away. Different budget room options are the Yellow Bird Hotel and the Rostrevor Hotel. The Saint Peter's Bay is positioned 20 kilometres (13 miles) from downtown St. Lawrence Gap. Another hotel is the The House by Elegant Hotels - Adults Only, which can be found 13 kilometres (8 miles) away. 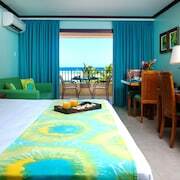 You could also choose to book a bed at the Cobblers Cove or the Crystal Cove by Elegant Hotels All Inclusive Resort. 17 kilometres (11 miles) to the north of St. Lawrence Gap you'll find Bathsheba, where you can spend the day visiting Soup Bowl and Bathsheba Beach. 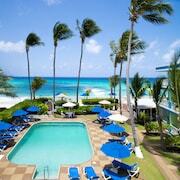 Bathsheba accommodation options include the Atlantis Hotel and Round House. 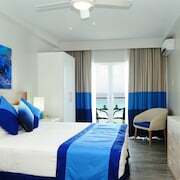 Or, you could consider staying in Oistins, 3 kilometres (2 miles) to the east of St. Lawrence Gap, where you can choose from the Sea Breeze Beach Hotel All Inclusive and White Sands Beach Condos. Regardless of whether you're passing through or spending a few nights in Oistins, set aside a little time to visit the Miami Beach and Dover Beach. Get your fix of local sport by making a visit to Kensington Oval, which is 7 kilometres (4 miles) to the northwest of St. Lawrence Gap. Those wanting to find accommodation close to the action can choose from the Sweetfield Manor Historic Inn and B&B or the The Soco Hotel - All Inclusive. Grantley Adams International Airport is situated 9 kilometres (6 miles) from St. Lawrence Gap. 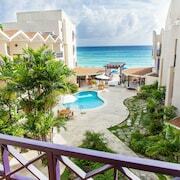 Should you wish to stay close by, can easily secure a room via Expedia at the The Crane Resort or Silver Point Hotel. 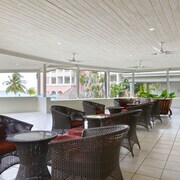 What are the most popular St. Lawrence Gap hotels? Are there hotels in other cities near St. Lawrence Gap? What other types of accommodations are available in St. Lawrence Gap? Explore St. Lawrence Gap with Expedia.ca’s Travel Guides to find the best flights, cars, holiday packages and more!